Although the upper canyons now lay dormant under man made reservoirs, the lowest section of the Bío-Bío still offers intermittent whitewater, easy access, and pleasant scenery and a reminder of what was lost upstream. Its class II-III rapids will challenge, terrify, and delight the novice. During the mellow interludes, you will have plenty of time to gaze off into the distance at Cerro La Pepa (1853 m) and Volcán Calláqui (3050 m). The Bío-Bío valley was the southern terminus of the Spanish colonial empire. Excluding a few coastal settlements, the conquistadors never subdued the inland Mapuches, who held fast for nearly 300 years by fiercely defended their homeland. They were one of the few indigenous tribes in the Americas to withstand the Spanish onslaught, maintaining a traditional lifestyle long after Chilean independence in 1821. Two of the six proposed dam sites in the Bío-Bío watershed, Huequecura and Aguas Blancas, are situated along this section of the river. If built, these dams would flood most of the run. Plans for the lowest hydroelectric site, Quitramen, include a four-dam complex that would inundate the floodplain between Santa Barbara and the Pan American Highway. From Los Angeles, 517 km south of Santiago, drive 3 km south on the Pan American Highway, then turn east on the paved road to Santa Barbara. 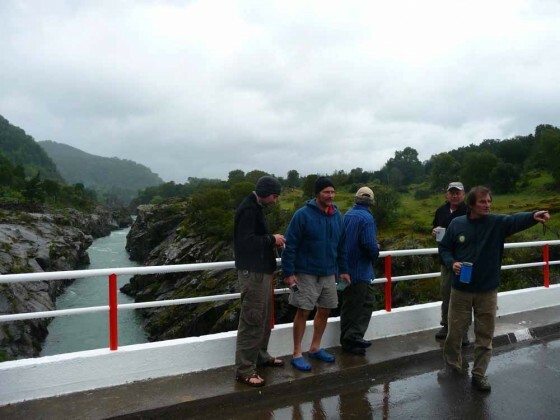 Continue upstream 42 km to the put-in at the confluence with the Río Queuco at elevation 330 meters. Take out at Puente Quilaco, 1 km upstream from Santa Barbara elevation 145 meters. To decrease the amount of flatwater, take out 16 km upstream from Santa Barbara immediately after passing under a concrete arch spanning the narrow canyon. You will have a short, strenuous climb to reach the highway. This 40 km stretch is best run in high water spring runoff but is adequate for year round paddling. With average gradient of 5 mkm or 26 FPM the river provides plenty of puch and play oppourtunites with springtime flows exceeding 10,000 CFS. I have been in Feb 2011 at the lower Bio Bio. Unfortunately a new dam is under construction (just in the narrow canyon). New roads are already built, a new bridge is under construction too, and I think 2011 will be the last year for the 12 km above the canyon. By the way, there is a comfortable put-in somewhat above the confluence with the rio Queuco at a balsadero (with a sign at the turn-off).